Analysis of mining fires from 1990 through 1999 showed there were 340 large mining equipment fires, resulting in 72 injuries and five fatalities. Many of the fires resulted in the loss of equipment and all posed potential or real risks to the operator. In 97 cases, the fires burned out of control, even after activation of the equipment fire suppression system, due to spraying of pressurized hydraulic fluid or fuel onto hot engine surfaces. In other cases, even after engine shutoff, the fires re-ignited, fueled by the continued flow of flammable fluids remaining in the lines onto the hot engine surfaces. In many of the fires, flammable vapors evolved and penetrated the cab, violently igniting, forcing the operator to exit under very hazardous conditions. Custom fabricated removable insulation systems for engine components such as mufflers, turbo-chargers and exhaust pipe runs feature high temperature capability, and a cool outer surface to reduce ignition of fuel and oils in the event of a leak or spray. reduced temperatures inside the engine room. insulation thereby improving fire prevention. 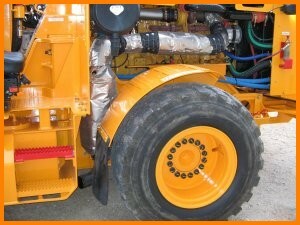 protection to the blanket for rough service environments such as mining. an extra safety layer to prevent fluids from entering the sections where the gap exists.